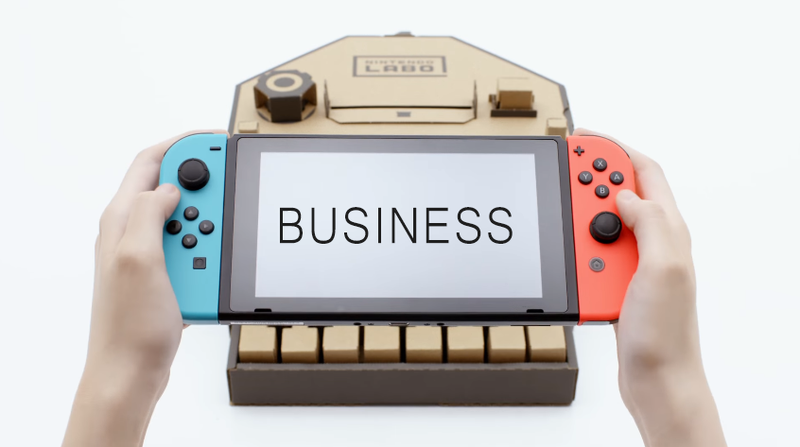 STAT | 4.2% - The one-day jump in Nintendo’s share price after the announcement of Nintendo Labo, a line of cardboard construction kits that work with the Switch. STAT | 750,000 - Number of 3DS systems sold in the US in December. The aging handheld apparently has some life left in it yet, as December was its best US sales month in three full years. STAT | $230 billion to $235 billion - Digi-Capital’s forecast for the worldwide combined revenue of gaming hardware and software by 2022. The console market is expected to make up just one-sixth of that, or $38 billion to $39 billion. QUOTE | “You want to talk homophobia? We work with Ellen Page who is fighting for LGBT rights. You want to talk racism? We are working with Jesse Williams on civil rights in the USA. Judge my work.” - Quantic Dream’s David Cage defends himself against former employees who allege he has overseen a toxic studio culture rife with homophobia, racism, sexism and overwhelming workloads. QUOTE | “Banter, jokes and laughs are part of our culture - but if it steps outside those behaviours, conflicts with our values or causes offense, we call it out and line managers take on the responsibility as role models.” - Jagex VP of HR and operations Dave Lomax joins a number of developers and executives offering advice on how to foster a healthy studio culture. QUOTE | “We knew we wanted our pant-wearing dino character Pantosaurus to be front and centre in the game, as he’s proven to be really popular with children and parents, and such a great character to help share our messages.” - Backy Sibson, brand marketing planner for the National Society for the Prevention of Cruelty to Children talks about a new game made with Wallace & Gromit studio Aardman to keep kids safe from sexual abuse. QUOTE | “We’re making changes to address the issues that affected our community in 2017 so we can prevent bad actors from harming the inspiring and original creators around the world who make their living on YouTube.” - YouTube executives explain why they’re demonetizing all content creators with fewer than 1,000 subscribers or 4,000 hours of watchtime in the past year. QUOTE | “The kinds of games Cold Iron develops will enable us to deeply explore the worlds of our franchises, starting with the Alien universe.” - FoxNext Games’ Aaron Loeb explains why the gaming arm of 20th Century Fox acquired the studio founded by ex-Cryptic devs with MMO expertise. He did not explain why Cold Iron’s first game based on Alien will be a shooter. QUOTE | “You might see some consolidation in esports over the next three or five years. Because right now everyone is jumping in - left, right, centre, they’re coming from all directions. There is only so big a pool, right?” - Gfinity chief strategy officer Bryan Healy believes there will be a thinning out in the ranks of esports companies in the near future. QUOTE | “You can’t make it scale. Everyone who has ever tried this - myself included - has discovered it’s not really the technical problems of latency, bandwidth or all the other things people talk about - it’s the operating cost.” - Bruce Grove, formerly of OnLive, explains why on-demand streaming game services have yet to take off.